In a large pot, combine the beer, water, old bay and butter and bring to a boil. 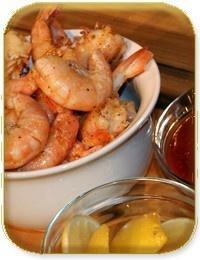 Add the shrimp, cover and reduce the heat to low-medium low for about 3 minutes or until cooked through. Drain and transfer to a bowl. Sprinkle with spiced salt mixture (recipe below) and serve with lemons and cocktail sauce. Mix and sprinkle over the shrimp.